In a previous McHenry County Blog articles Comparing McHenry County Property Tax 2002 Versus 2016 it was discovered that while the Consumer Price Index (CPI) has increased 33.8% from 2002 to 2016, most McHenry County governments’ levies have increased in excess of CPI. In the graphs below, you can see how different taxing bodies compare in terms of levy increases. McHenry County has increased property taxes at almost twice the rate of townships governments. Part 1 on McHenry County numbers can be found here: Comparing McHenry County Propery Tax 2002 Versus 2016-Part 1. Part 2 on Library & Park district numbers can be found here: Comparing Library and Park District Tax 2002 Versus 2016-Part 2. In other words, other than Fire Districts, the County has been INCREASING their property taxes more than other units of government and therefor SHOULD reduce their property tax levy PERMANENTLY — Not temporarily has Franks and his minions have done!!!! Vote for County Board candidates who are willing to permanently reduce your property tax!! The referendum on your ballot this year to encourages other units of government to reduce their property tax is an absolute insult!!! A permanent reduction of the county property tax is in order. The County Board can do NOTHING about the taxes levied by schools. Only the School Boards can do that. Go talk to them and VOTE in the appropriate elections!!! Blue AND Pink sections of the pie are the largest sections which are schools. 70 percent of my tax bill is the schools. Of course we need schools and need to fund schools. But, that does not mean we should blindly give those in control of funding and running schools a blank check to spend. What can be done to make schools more efficient? (Of course we want outcomes that are effective.) What can be done to consolidate districts and job functions to eliminate unnecessary and redundant job positions? What is being done to have school districts justify every single job position in all “administration” functions? Can we do without some functions or can these functions be streamlined o cut back? What can be done about the outrageously high salaries and benefits of some administrators and some teachers? The Luna-tic tock cultural Marxist checks in ….. Right now the Teacher’s Union has discovered that you can run teachers for the school boards and then call all the parents and union members to come out and vote in a low turn out election where they can control the outcome. Then they will go ahead and vote on teacher contracts even though the money is coming right back to them. The only way to do something realistic about property taxes is for tax conscious taxpayers to organize a Get Out The Vote effort aimed at the Consolidated Election cycle to get people to come out and vote. It’s easy to identify your voters. They are going to be R’s and over 55. Piece of cake. THAT election will be in April of 2019. Petitions can be circulated right after the Fall General Election. Stop using your fingers here and use your feet on the street. If you keep harping on county board elections you will not get anywhere on this issue. The Fire Protection Districts are amateurs. To really get an award as a professional politician you need to be like Algonquin Township! Spend, bonus, spend, tax, tax, spend, go to Disneyland, tax, buy expensive clothing, tax, sign secret labor agreements, leave obstacles for your successor, create legal problems, pay family bonuses, claim it’s your family business, lose an election and blame your successor for spending too much on legal bills for the problems you created. Do we really need MCC, McHenry County Communist training center for illegal aliens & libtards? 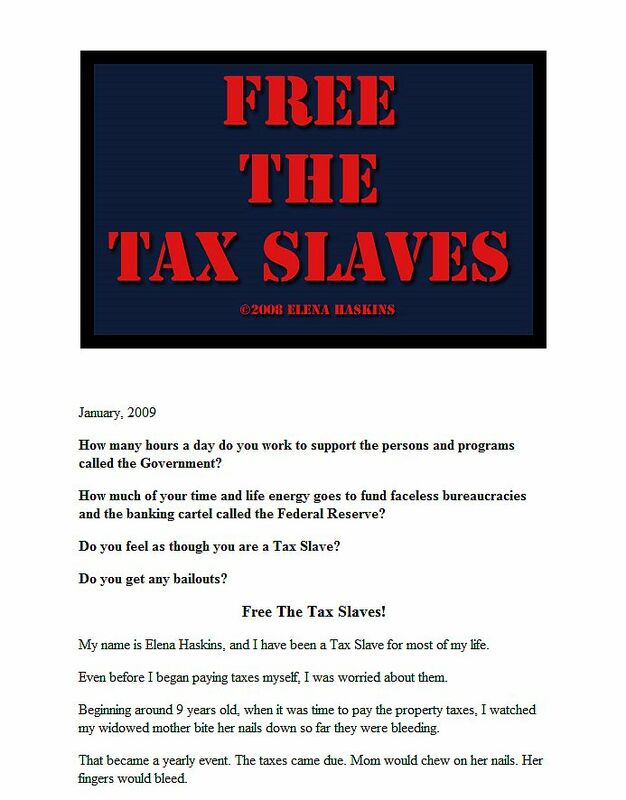 Who’ll free the tax slaves? One other factor that is ignored in these levy studies here is population growth and loss. Per a basic google search, McHenry County was at 278,000 people in 2002, before ballooning to 318,000 in 2008, and tapering to around 308,000 in 2017. An increase in population means an obvious increase in levies for fire or schools, because you have more houses to cover and more students to teach. Most levies clearly didn’t adjust for the downward trend in population after the market crash in 2008/2009, which is worth diving deeper into. But you can’t just compare the levies to the CPD. A more definitive would be tax dollars levied per person through the years. Feel free to make the adjustments. I’ll be happy to publish them. “County Population increased by 10.55%. County Assessments have increased 29.44%. County expenditures have increased 88.41%. Anyone else notice that the County increased their expenditures by 88.41 % but population only increased 10.55 % and the CPI by 33.78 %? The County and other units of government are not just increasing your property tax, fees and other sources of revenue have also been increased. Take over school boards, talk to school boards, voting for school boards will help but absolutely NOT solve the root of the problem! The root problem is Madigan and the majority in Springfield! They are refusing to launch a referendum to eliminate the Constitutional public sector pension guarantee!! If Rauner and Pritzger were serious about saving Illinois, they would use some of their vast wealth to sponsor a petition drive to hold a referendum for removal of the public sector pension guarantee!! Instead they are pouring millions into TV advertising against their opponents!! Disgraceful!! In other words, non-partisan municipal boards have done a better job keeping taxes down than the Republican County Board.